Go for it! Important chemistry should be difficult for being clever, not for being tedious. 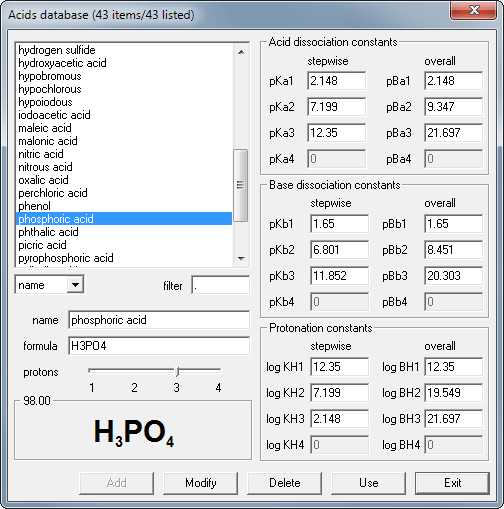 Select acid and base from database. pH - ready! 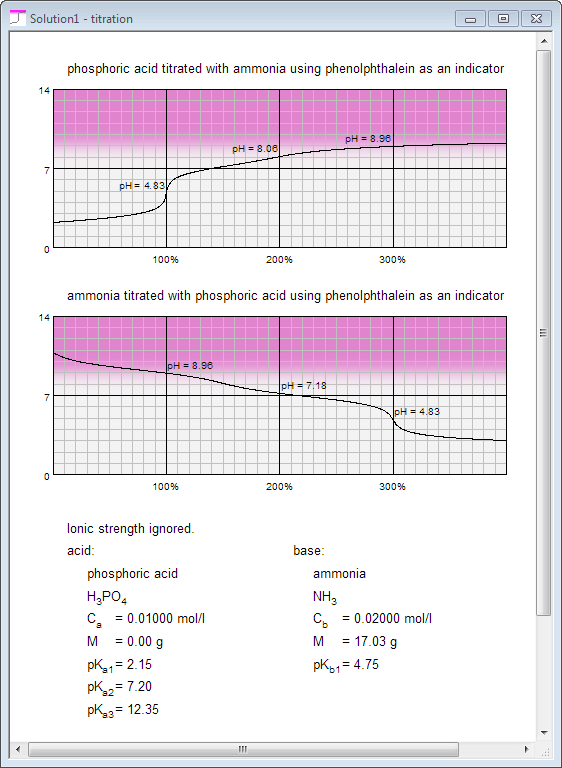 Titration curve - ready! (NH4)2HPO4 is a salt of a weak acid - not fully neutralized - and a weak base. Before pH calculation of the solution one must properly identify which process - third step of acid dissociation, or hydrolysis of NH4+ ions, or hydrolysis of HPO42- ions - plays decisive role in the equilibrium. That's not an easy task, and it requires experience and time. With BATE you will have answer ready in less than 15 seconds. You will mix weak acid and weak base to create a salt. Start new solution, clicking on the New button on the tool bar. Solution window looks exactly like the one you may see below the database window (scroll page down one picture if you want to see it now), just all fields are empty. Double click the phosphoric acid name on the list to copy it's dissociation constants and molar mass into the solution window. Repeat the same for the base pane, this time selecting ammonia. You have added right substances into the solution, time to enter concentrations. Concentration of phosphoric acid must be 0.01. 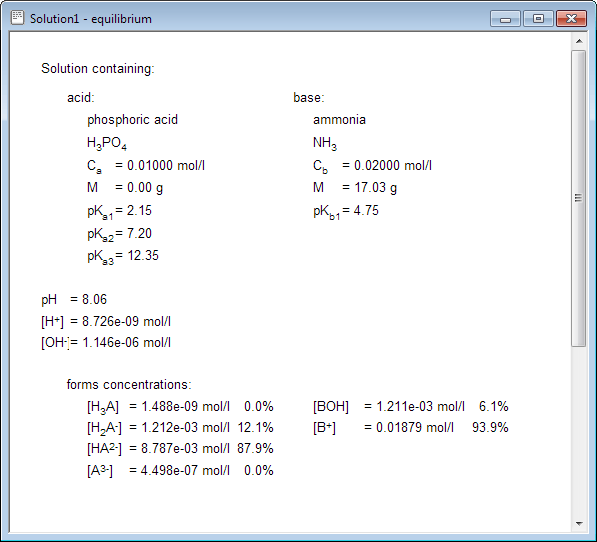 Enter this value into acid concentration field. 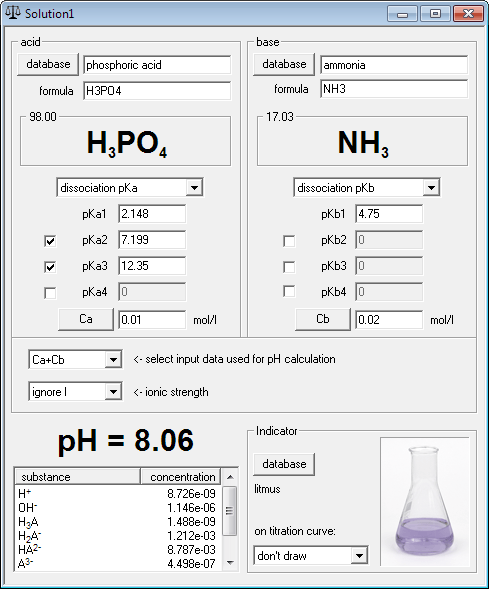 Note that at this moment you already know pH of 0.01M phosphoric acid solution - it is 2.25. Enter 0.02 into the base concentration field, as in (NH4)2HPO4 solution ammonia concentration is two times greater than concentration of phosphoric acid.